Don’t let those delicious and nutritious fresh herbs go to waste. Instead, try this flavor saver. 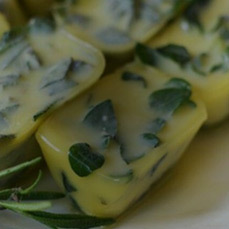 Freeze leftover herbs in ice trays with a little olive oil. When you’re ready to use them, simply pop out what you need and defrost or add directly to your pan. Live text from How-To Make Pesto Pucks How-to item.